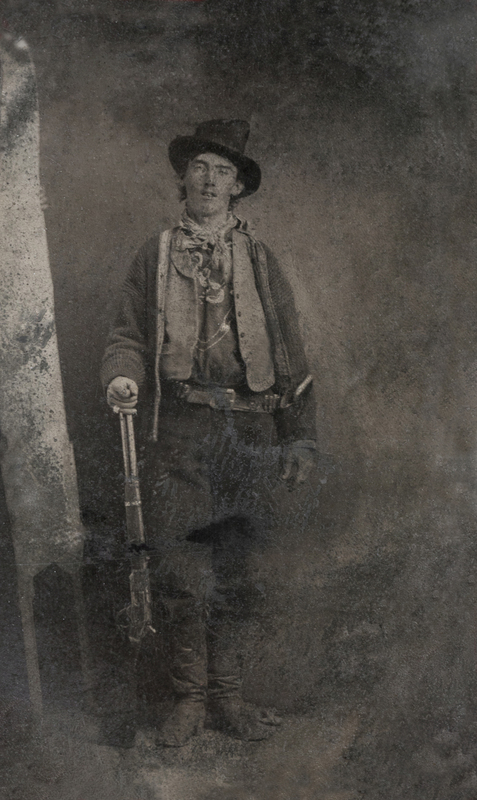 I keep finding neat old photos that have guns in them so thought I would start a thread. Feel free to add info on the type gun or vintage. Even suggested captions but keep them non political and clean so the tread doesn't get shut down. Here is one to start it off. Captions would be good too. Which of course led everyone to believe he was left handed because of his six gun location, until it was realized that the image was flipped from reality. The proof that everyone overlooked for a long time is found on the rifle. What is it? The loading gate on the 1873 is on the right side of the rifle. That image has it on the left. Tintype were a direct positive transfered onto a thin sheet of metal which produced a reversed image. In the first one, either those guns are huge, or those women are pretty small. The revolver in the belt looks massive on her. Some cams had a mirror before the plate to make it correct positive. Love the posts so far. I have no clue, I just know its vintage. Here is Edison and Henry Ford on one of their camping trips. I assume Ford is just clowning around. He's holding a Colt so I reckon so. My great grand dad. I don't have a clue what the guns are. How's this for a well equipped ride? I assume these were staged photos but neat anyway. Interesting that the guy with the least powerful weapon is in the most exposed position. I think he made the cover versus concealment mistake. He assumes that window and roof will protect him when really it just conceals him. Can't leave out Phoebe Ann Mosey aka "Miss Annie Oakley", "Little Sure Shot", "Little Miss Sure Shot", "Watanya Cicilla", "Phoebe Anne Oakley", "Mrs. Annie Oakley", "Mrs. Annie Butler", and "Mrs. Frank Butler". These 3 images are from her early years. When Phoebe was only 15 years old she won a shooting match with traveling-show marksman by the name of Frank E Butler. She ended up marrying him and traveled the world performing shooting exhibitions and competitions. This was her in 1922 at the age of 62. She died 4 years later from Vitamin B12 deficiency anemia. Every wonder how Annie and other trick shooters could get away with shooting in an arena and not take out some of the audience? Not sure if they did it all the time but I heard a story years ago that they found some old ammo from Annie. When they examined it the bullets were wax with fine shot pellets mixed in. The speculation was that the wax would melt and come apart when shot so only the fine pellets would be flying around making them safer and a bit easier to hit targets. Every wonder how Annie and other trick shooters could get away with shooting in an arena and not take out some of the audience? Not sure if they did it all the time but I heard a story years ago that they found some old ammo from Annie. When they examined it the bullets were wax with fine shot pellets mixed in. I would say there have been more than a few exhibition shooters that used special purpose custom made ammunition to aide in their ability and effects. I was fortunate enough to see the late Bob Munden perform two shows. Both shows were done indoors so he mentioned all of his loads were wax and black powder. One of the tricks he did was load two rounds then quick draws and fires both rounds so fast they sound like one shot. Then to step it up he has two balloons set up about 5 yards in front of him and about 8-10 feet apart. He loaded two rounds and then quick draws, firing both rounds and bursting both balloons almost simultaneously. They may have booth burst simultaneously as that it happen too fast to really tell. While he did have a skill level unlike most to draw and shoot very quickly his was aided in hitting the balloons by the fact he used black powder. The 45 long colt black powder loads would produce a lot of unburnt powder that exited the muzzle like shotgun pellets thus bursting the balloons with quite a bit room for point of aim error. However he still did it amazingly fast and with his usual Bob Munden nothing to it style. And to step it up a notch here it is with a Bond Derringer less the quick draw. I was always curious about the duo of Bonnie and Clyde and was curious and to what type of guns they preferred. I new Clyde was fond of the BAR as a long gun and Bonnie was a shot gun person in long guns. I have seen several movie remakes of the story of Bonnie and Clyde but after doing some research was very surprised to find out that there was no Tommy guns used when they killed Bonnie and Clyde like in the movies. It was later stated that Bonnie and Clyde were both actally killed by the same rifle calibre and very possibly the same shooter. Here is a link that tells the story behind the Remington 8 rifle used.